After a longtime local passed away, residents paid tribute by helping her feline friends. 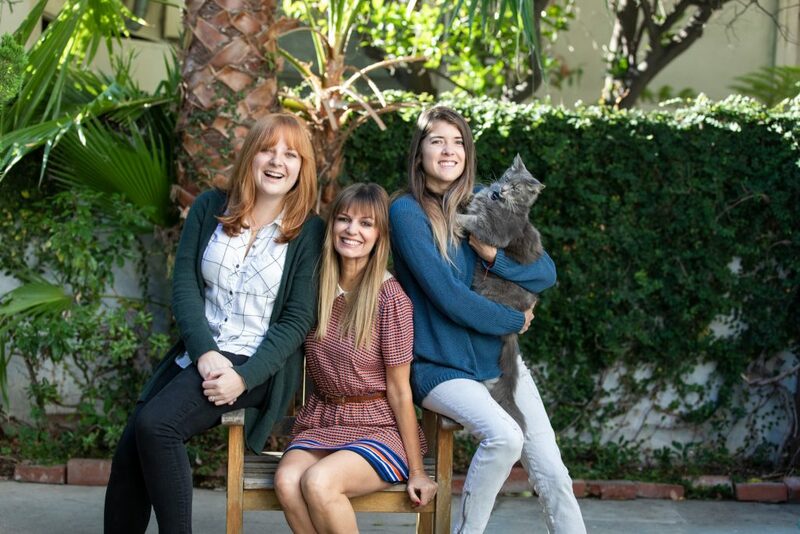 CAT CRUSADERS Hillary Jackson, India Dupré and Pauline Dawson helped spearhead the adoption effort. Photo by Daniel Deitch. HEIGHTS OF ACHIEVEMENT In addition to her love of cats, longtime Toluca Lake resident Judy Coates was known for her high-flying past. 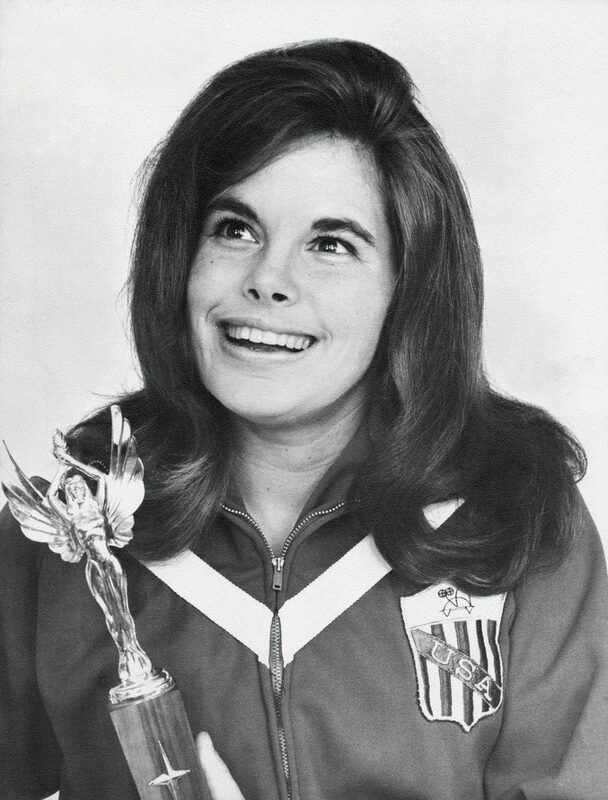 Competing under her maiden name, Johnson, she had been crowned the World Champion on the Trampoline in her youth and appeared in the February 1966 issue of Modern Gymnast. Photo courtesy of India Dupré. I quickly learned her reasoning — she lived next door and could see into our dining room from her kitchen window. Our frequent interactions with Judy were unlike any other tenant–landlord relationship I’d experienced or heard of. She was a fixture of our little slice of Cahuenga Boulevard for more than 40 years, and the reason we found ourselves in our neighbor India Dupré’s apartment for a mini-memorial this past September after we learned Judy had died. There, we laughed, cried and swapped stories. From my neighbors, I learned Judy was a world champion trampolinist, and you could look over and see her bouncing past her roofline when her health was better. Others shared how she’d let late rent slide when they were having a bad month, and how her hunt for tenants sometimes involved going to lunch with prospective renters to give them a chance when things like student loan debt had ruined their credit. At the end of the gathering, Dupré made an announcement: Arianna Boldish, Judy’s friend and her cats’ caretaker, had a month to help Judy’s 17 cats find new homes, and we needed to help her. A couple days later, we received a late-night, panicked message from Boldish saying she now had a week to find new homes for the cats, or they would be taken to the pound. 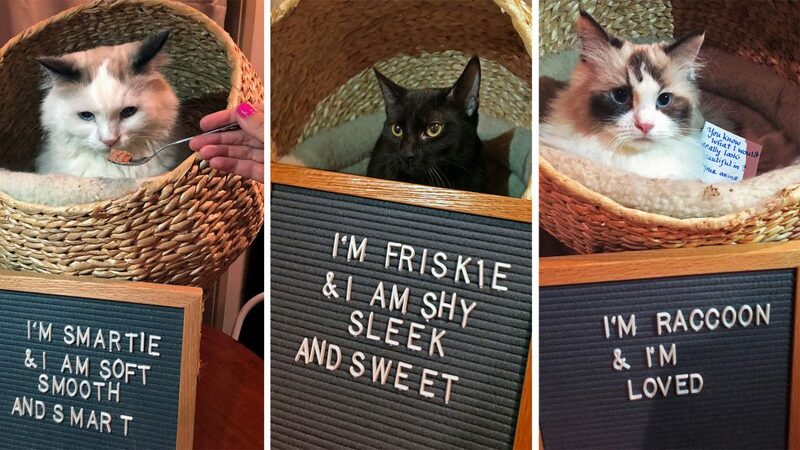 While we’d initially planned a well-staged cat photo shoot using ideas we found on Pinterest, with the new deadline, that careful planning went out the window. Joined by another neighbor, Pauline Dawson, Dupré and I walked over to Judy’s house that night — in our pajamas — to take photos of the cats and comfort Boldish. We knew time wasn’t on our side. We quickly got to know the cats, too. While many of them had sweet temperaments, Georgie 2, a cat who’d never recovered from a broken pelvis, broke our hearts. He was sweet and silent, unlike Georgie 1. He had taken Judy’s death hard — he’d stopped eating. Dawson posted the photos to Nextdoor, and I posted them to Facebook, where they were shared more than 600 times that week. Those notifications turned into people wanting to meet the cats at all hours, which meant my neighbors and I were in contact like never before. Someone interested in a cat would reach out and we’d text one another to see if one of us could meet them, and that was usually Dawson. We’d taken the pictures Saturday night, and by Monday we’d adopted out nine cats. Dupré gleefully checked off their names on the spreadsheet I’d made to organize our leads. We celebrated with a quick Sharky’s dinner in our communal outdoor space before Dawson met a UCLA law student who adopted Raccoon, a ragdoll who’d become a favorite of ours. 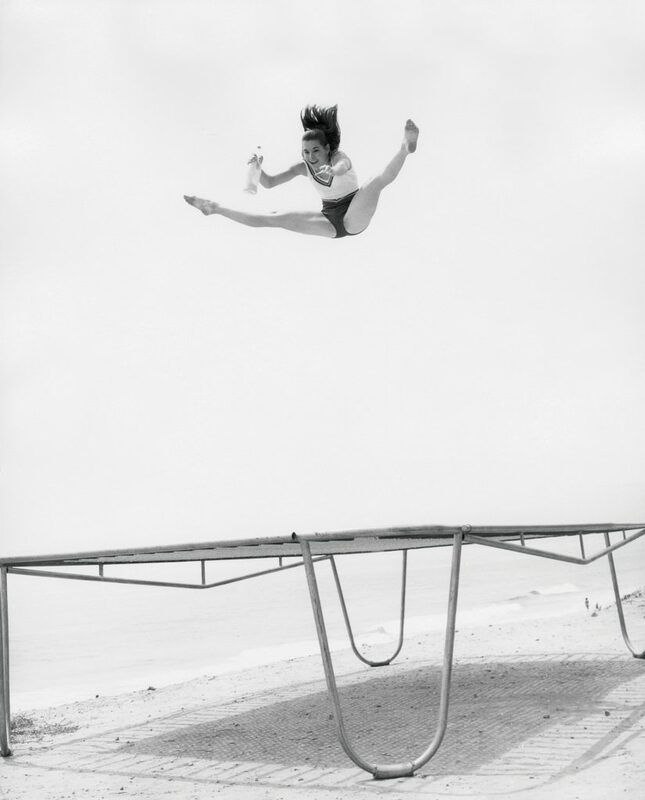 JUMPING JUDY Coates continued trampolining throughout her life, and traveled to schools with her late husband, Harold, to promote good health, the importance of daily exercise and saying no to harmful substances through their LAUSD-certified Jumping Jacks program. Photo courtesy of India Dupré. I posted the note to the feed, and updates started coming in from the others. “When people sent in their videos of them in these beautiful homes, all loved and receiving so much attention, all of our hearts melted and we were so happy — the best part of all of it was seeing them in their new homes,” Dupré says. 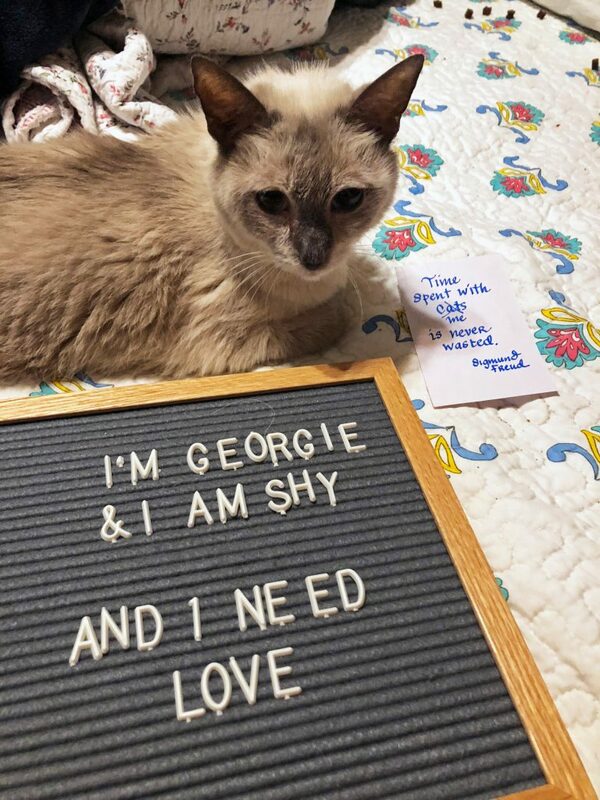 Each day more cats went to new homes, and a woman named Deborah Corday connected with Georgie 2. Her only concern was Georgie’s health — she didn’t want to put her cat through grief again after having just lost its companion. When it became clear Georgie 2 wasn’t getting better, my colleague Kathy Lovin, a dedicated cat rescuer, volunteered to take him to the doctor. The tests were inconclusive, and Georgie had yet to eat. Still, Corday was interested, so I connected her with Lovin, and the pair tried everything possible to help Georgie. As this was going on, Nessy, the final cat at Judy’s, was adopted. She was painfully shy, needing to be surrounded on three sides at all times. We were thrilled she found a patient home, but with Georgie 2 in limbo, things were far from over. SPRING IN THEIR STEP Judy and Harold Coates performed their trampoline routines for groups ranging from the Burbank Kiwanis Club to the Las Vegas International Circus. Photo courtesy of India Dupré. After a few glimmers of hope, Georgie took a sharp decline, and Lovin and Corday decided it was best to euthanize him so he’d no longer be in pain. Corday arranged for her vet to come to Lovin’s house for the final procedure. The women held his head and kept his body comfortable. Afterward, they held up Judy’s tiny sweatshirt Georgie had slept on and talked about who she was. They’d never met her, but they shared her stories. The pet crematorium sent a candle to remember Georgie, and we added it to the memorial our neighbors put together to honor Judy. We still think about her, and how she brought us together. 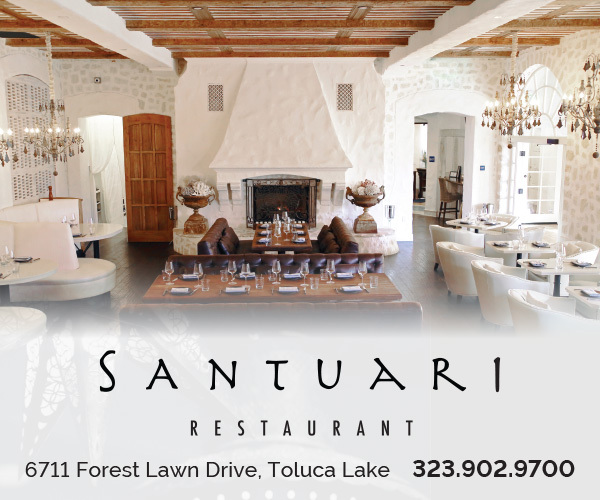 Hillary Jackson is a writer living in Toluca Lake whose words have appeared in the Washington Post, Architectural Digest and The Week, among other outlets. When she’s not working, you can find her walking her West Highland terrier, Nessie, or riding bikes with her husband around the neighborhood — sometimes with Nessie in tow.